Join us in Havana for the 69th Annual Ernest Hemingway International Angling Tournament, held at the Hemingway Marina, just west of Havana! This marina is the largest on the island and has been hosting the event since its inception in 1950. The tournament is based on teams of up to four anglers, and the target species for the tournament are blue marlin, white marlin, sailfish and spearfish. Prizes are awarded for the following categories: first catch of the tournament; first catch at the second, third and fourth sessions; youngest angler; largest dorado; largest tuna; and female anglers who catch marlin. 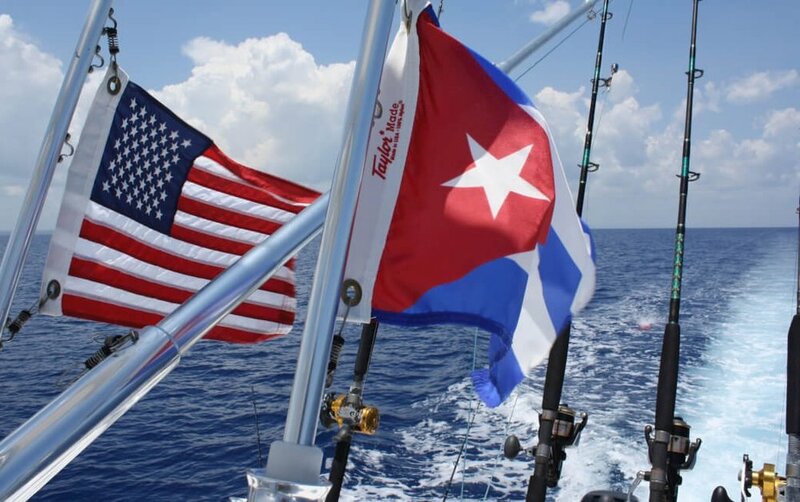 Be a part of a storied tradition of fisherman who have sailed the northern coast of Cuba in search of the largest marlin. These waters were the inspiration for Hemingway’s story The Old Man and the Sea. Fish by day and enjoy all the cultural and culinary offerings of Havana by night! Arrival to Havana (pending flight information). Dinner Reservation at Río Mar, located in the luxurious Miramar neighborhood, it has a whole terrace overlooking the where the Almendares river flows into the sea. 3ra y Final #11, La Puntilla, Miramar. (not included – to be paid on the ground). Walking tour of the Old City. Wander through the Plaza Vieja, the oldest plaza in Havana, dating from the 16th century. See the Plaza de San Francisco, a cobbled plaza surrounded by buildings dating from the 18th century, dominated by the baroque Iglesia and Convento de San Francisco dating from 1719. Visit Plaza de la Catedral and the Catedral de San Cristóbal de La Habana. Visit the Plaza de Armas, a scenic tree-lined plaza formerly at the center of influence in Cuba. It is surrounded by many of the most historic structures in Havana as well as important monuments. Explore on your own and take part in activities that support the Cuban people, such as visiting art galleries, eating at private restaurants, speaking with artisans, or hiring private cars and bicycle taxis. CET representatives will offer guidance on ensuring legal compliance with OFAC regulations. Registration and opening ceremony for the 69th Annual Ernest Hemingway International Angling Tournament, including a welcome cocktail. Marina Hemingway. Hemingway Finishing Tournament. Marina Hemingway. Dinner Reservation at La Guarida paladar, famous not only for its delectable dining, but also as the location for the film Strawberry and Chocolate. It is housed on the third floor of a large, old town house carrying the charming ambience of the early 1900s. Concordia e Gervasio y Lealtad, no. 418 altos, Centro Habana (not included – to be paid on the ground). Dinner Reservation at Mediterraneo Havana, a modern, family run paladar in the Vedado neighborhood. This cozy paladar produces much of what it serves at a nearby farm in Guanabacoa Cuba, including the vegetables and dairy products. Calle 13 #406 entre F y G, Vedado. (not included – to be paid on the ground). Optional: Head to Eastern Havana for a tour of Alamar, a Soviet style housing project, and Havana’s eastern beaches. Alamar, one of Havana’s largest neighborhoods, is filled with prefabricated buildings completed by the popular micro brigade movement in Cuba in which neighbors constructed and worked on building their own homes. Meet with local residents and visit a farmers’ market and ration store to get a feel for local living. Visit Playas del Este (eastern beaches), where Habaneros go to escape the city heat. Take a stroll in the white sand and a dip in the turquoise water. Dinner Reservation at Tierra, Havana’s newest international dinning spot. Located inside a container in the Fábrica de Arte Cubano, the restaurant mirrors the eclectic crowd, serving dishes from around the world. Calle 26, between Calle 11 and 13, Vedado (not included – to be paid on the ground). Check out sister restaurants: El del Frente and O’Reilly 304. These two paladares are some of the trendiest and hippest eateroes in Cuba at the moment. Stylish, unassuming ambience, spectacular food and a sprawling cocktail menu, this paladar is a rising star of Havana’s culinary scene. O’Reilly #304, entre Habana y Aguiar. Hemingway Finishing Tournament and closing ceremony. Marina Hemingway. Farewell dinner at Paladar San Cristobal. Located in the heart of Central Havana, this paladar has a reputation of excellence in both atmosphere and local cuisine. Enjoy great food while the local takes you back to the 1940s and 50s. Check out and depart for the airport (2 ½ hours before your flight departs). Dinner at Paladar Atelier. This restaurant is equally known for its atmosphere and exquisite cuisine. The lighting and textures of the house, which was home to a pre-revolutionary senator, coupled with walls adorned in modern art, create a cozy, but modern setting. Driving tour of Havana. Visit the Miramar neighborhood, a residential district of the municipality of Playa, where many embassies are located including the landmark Russian embassy. Drive along the famous Quinta Avenida (Fifth Avenue) and see the mansions that used to belong to many of Havana's upscale residents prior to the Revolution. Visit the Vedado neighborhood and its main landmarks, including the Christopher Colon Cemetery and the University of Havana.